Somebody pour this fabulous woman a glass of champagne! If you are the type of dame that enjoys a drink, a dance, and an old fashion good time, then it's time that you started living the flapper lifestyle. Oh, we also forgot to mention that you're always going to be covered in fringe. There's fringe on the shoulders and fringe on the skirt so you'll want to dance the night away – twirling all over the dance floor just to show it all off! Just throw on some pearls and your feathered headpiece because you're so ready to be the cat's meow! This unique 1920s mint coco flapper costume dress will give you a look that’s worthy of any speakeasy or 20’s theme party. Forego the usually mono-color sequin and fringe dress for this elegant and playful costume. The 100% polyester dress has a square neckline and an Art-Deco inspired geometric print on the front that is sure to get you the right kind of attention. The arm openings are surrounded by long fringe as is the dropped waist of the dress. But the dress isn’t enough – we’ve included a 36” long string of faux pearls with a silver plastic filigree medallion to give you a little extra class. The fabric headband fastens with Velcro at the back and has a medallion with feathers at the front for an authentic look. 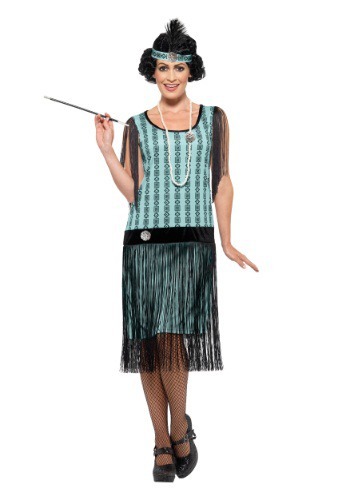 Top it all off with the included cigarette holder and you’ll look like you stepped off the screen of a silent movie!